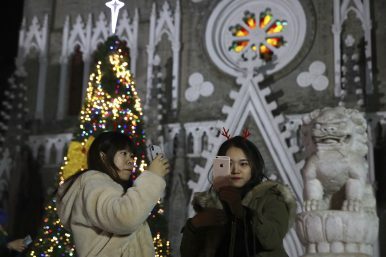 Women take selfies in front of the Xishiku Catholic Church during Christmas Eve in Beijing, China, Monday, Dec. 24, 2018. A brief history of China’s delicate dance with Christianity at Christmas. It’s never been easy to be a Christian in China. Over the past three decades there was, however, for a while at least, a relaxation of the pressure that Chinese Catholics and Protestants face when they attempt to worship, either in State-approved churches, or in the underground churches that multiple sources report number in the tens of thousands throughout the country. The first important sign that China was restoring the right of Catholics to openly worship came at Christmas in 1987. St. Joseph’s Dongtang Church, on Wangfujing, Beijing’s most famous shopping street, opened to the public for midnight mass on Christmas Eve. It was a freezing cold night, which did not deter in the least the mass outpouring of people who flocked to the church, which had seen little religious activity since the communist takeover in 1949. Many in tears, the mostly older crowd, including elderly women with bound feet, poured into the church, packing the pews and every standing space. A plastic Jesus framed in colorful Christmas lights graced the altar. In place of lay deacons, the priest was assisted by a crew of bao’an – security – wearing red armbands. Hundreds flocked to the front for communion, their first in nearly 40 years. A foreigner, one of no more than a dozen in the congregation of nearly 3,000, was roughly turned away from the communion queue. The message was clear. A foreign religion thought then and now to taint Chinese parishioners with unpatriotic behavior, and to tempt them away from communist orthodoxy, could nonetheless be nominally practiced under Chinese Communist Party (CCP) supervision as long as foreigners themselves did not participate in its rituals. The uneasy struggle that China has had in the decades since to control the rise of Christianity in China – and its potential impact on the political power and legitimacy of the CCP – has taken an uneven, often paradoxical road. In the early 1990s, a Christmas card sent to a Chinese address could still find itself “returned to sender”: torn open, clumsily taped closed, and sent back to its originator’s mailbox. By the end of that decade, Communist Party officials themselves were giving Christmas parties to staff and foreigners alike. Santa Claus was ubiquitous, prizes were given out, and Jingle Bells was played incessantly (as late as July, in some instances). Conspicuous by his absence in these boisterous public displays, however, was any mention or symbol of the very fellow whose birthday Christmas celebrates, Jesus of Nazareth. In fact, by controlling the narrative through its nearly-unassailable monopoly on media and education, by the end of the first decade of the 21st century, China had successfully managed to block the entire raison d’etre of Christmas from the understanding of millions of its younger citizens. This year, in the wake of the destruction of China’s best-known, underground-but-tolerated Christian place of worship, Zion Church in Beijing, the days leading up to the holiday itself seemed flat, dull, and uninspiring in the capital (although a life-size Santa was spotted riding an elevator in a well-known hotel just steps from St. Joseph’s Church). Reports abound that the purely-secular expression of Christmas which the government has grown accustomed to tolerating have undergone a real crackdown in lesser-known cities around the country, as well-documented by the Associated Press’ Erika Kinetz. Ever-pragmatic Shanghai, however, seemed to maintain a holiday exuberance which its commercial sector would have certainly supported. One of China’s problems in containing the rise of Christianity is the rise of believers within the ranks of the powerful and the Party themselves. A former cabinet-level vice-minister, instrumental in negotiating a major Hollywood studio’s cooperation with the Chinese government, proudly proclaims himself as a Christian. He adopts a young daughter and tells all who will listen how Christianity has changed his life. Parents of Chinese students eager to provide their children with a coveted American high school education compete to gain acceptance to Catholic and other faith-based schools in the United States. Carefully questioned to ensure they understand that their children will be required to attend mandatory religion classes and services, many of those parents privately express not only agreement but enthusiasm for the idea. China has reason to feel confident in its ability to dampen the effect of Christianity in the country, and to minimize its power. Emboldened by a deal with the Vatican in September to cooperate on the choice of Chinese bishops, the government now has proof for its belief that even long-standing international critics of its religious rights record will eventually negotiate their position in China’s favor. Meanwhile, while not necessarily fearing the power of a rising Christian presence in China, the CCP would certainly like to erase the necessity of having to counter its influence in the first place. There appears to be one aspect of the Christian faith which has escaped the deep understanding of the Party, however. Christianity has always thrived in the presence of suppression, repression, and martyrdom. In that light, China continues to provide fertile ground for a bumper harvest of devout Chinese Christians. Santa gets pushed out as China's leaders emphasize tradition.